(NC) If you own a commercial vessel or a fishing or recreational boat, there are certain rules to follow, such as obtaining your boating licence or registering your vessel. This season, you also need to be aware of new prohibitions and responsibilities. In the summer of 2019, the Wrecked, Abandoned or Hazardous Vessels Act comes into force, under the Government of Canada’s Oceans Protection Plan. It’s designed to address the growing problem of wrecked, abandoned or hazardous boats that are posing hazards to our waters and creating safety risks for people and the environment. It’s currently estimated hundreds of these vessels exist in Canadian waters, ranging from small pleasure craft to large commercial ships. 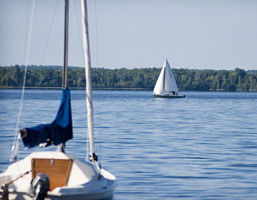 The Act prohibits boat abandonment and irresponsible boat management, strengthening owner accountability and liability for the end-of-life management of their watercraft. Under the new rules, you could be fined for abandoning your boat; leaving it adrift for over 48 hours; or causing it to become a wreck by sinking, stranding or grounding it. You’re also prohibited from leaving your boat in poor condition or in a dilapidated state in the same area for more than 60 days without prior authorization. You are also prohibited from leaving your dilapidated boat on federal crown property, such as a small craft harbour, without permission. Remember that as an owner, you are responsible for using your boat safely, keeping it in good working order and properly disposing of it when it reaches the end of its life. You are also responsible for any hazard-related costs, including clean-up and repairs. If you find a wrecked, abandoned or hazardous boat, report it to the Canadian Coast Guard. Find more information at www.tc.gc.ca/abandonedboats.